Are trail shoes durable enough? Like many backpackers, I have made the switch to lightweight, breathable, non-waterproof footwear. It’s an approach with many benefits, but I’ve come to discover one significant disadvantage: durability. I first used the original 5.10 Guide Tennies as lightweight approach shoes in the mountains – that is, footwear capable of the walk-in to the crag, as much scrambling as you like, and even easy rock climbing (I used mine up to about Diff). The Guides were more climbing-oriented than walking-oriented, but I soon discovered that walking in them was far more comfortable than in boots, and I often wore my Guides for outings where I never went anywhere near any rock. My first pair wore out pretty quickly. I blamed Skye gabbro, but my second pair sprang holes in only a few months too. In fairness, these shoes were used and abused – I used to get out in the hills several times a week back then, although I never used them on longer trips. More recently, I have used similar footwear for long-distance backpacking. And I’ve started to notice a pattern emerging. In March 2015, I purchased a pair of Inov-8 Roclite 295 running shoes, which came highly recommended at the time. First impressions were great – the upgrade in walking comfort was dramatic, but it took some getting used to the idea of wearing such apparently flimsy shoes on the hill. I began the Cape Wrath Trail in these shoes, but after 150 miles, at Ullapool, massive holes had opened up between the soles and the uppers. Worse, the soles appeared to have collapsed and were making my feet sore. Wary of the Roclites completely falling apart before the end of the trail, I purchased new shoes in Ullapool. I was disappointed – apart from the durability problem, the Roclites ticked every box, and I loved walking in them. It took me a little while to get used to the Merrells I purchased in Ullapool. At first the strange lacing system felt weird, and I had initial doubts about sizing. But after they performed so well on the Tour of Monte Rosa in September 2015, I fell in love with these supremely comfortable shoes. As soon as I found them on special offer, I bought three spare pairs to keep in reserve. After the TMR, I noticed small splits in the lightweight mesh material along each side of the shoes. 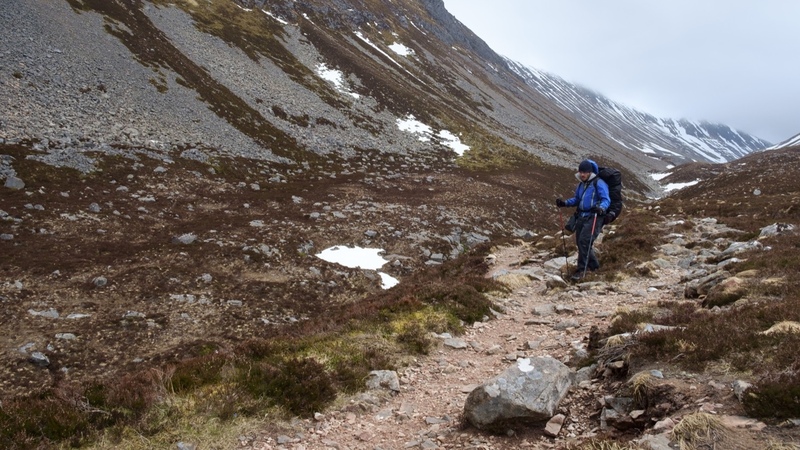 Since this mesh is purely there to keep out debris and has no structural function, I wasn’t at all worried – and in fact I began hiking the West Highland Way in April 2016 with the same pair of shoes, confident they’d last the distance. But by the time I reached Aviemore after 200 miles on the trail, the Merrells were in bits. Those small splits in the mesh had grown into gaping wounds and the sole tread was heavily worn. The sole units are composite, partly foam and partly Vibram rubber, and I was worried that the Vibram would completely wear through, leaving only the foam cushion for grip. I binned them and switched to my second pair. My second pair of Merrells did not last as well as the first, although there is no difference in sizing. I hiked the Skye Trail in my second pair, and noticed those cosmetic splits in the mesh after only twenty or thirty miles! By the end of the ST they were looking a little beaten up but I was confident they would last at least another 300 miles. So when I headed off to the Pyrenees to hike a planned 250-mile route, I had no reservations about wearing these shoes. 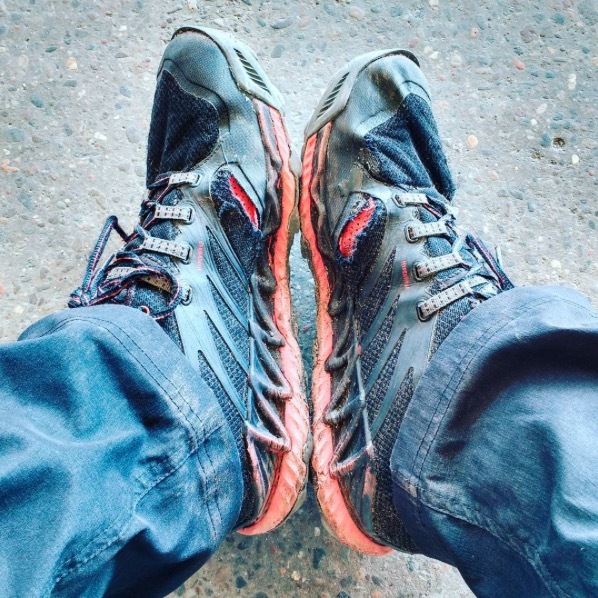 Since March 2015, I’ve hiked around a thousand miles in lightweight trail shoes1. That’s nothing compared to some people, and three pairs of shoes isn’t enough to make any kind of scientific judgement, but I feel a pattern is emerging. On average, I completely destroy lightweight shoes in just over three hundred miles of rough mountain terrain. Three hundred miles may sound like a lot, but it really isn’t. It has made me think about my trusty Scarpa mountaineering boots. I don’t do long-distance walking in them, great as they are for winter hills, but over the years they must have clocked up at least 1,000 miles. At least. And they could probably do the same again before the tread is too worn down to use safely. As for the uppers, they look almost brand new. Of course, it’s obvious that gossamer-light footwear is going to wear out more quickly than clomping great big boots. Maybe I’m comparing apples to oranges. One reason why my lightweight footwear sees so much mileage in a comparatively short space of time is because of the enormous advantages in hiking long-distance with mesh shoes: increased comfort, fewer blisters, no more overheating or macerated feet, greater agility, improved ankle strength, and so on. I am certainly not going to stop hiking in mesh shoes, because the benefits convinced me long ago. I have even become comfortable pushing them into moderate winter mountaineering scenarios – more on this in the November 2016 issue of Trail magazine. But I can’t help thinking that these mesh running shoes we select for backpacking should be a bit more robust. Someone hiking, say, the Continental Divide Trail might get through ten pairs of trail shoes in one trip. Ten pairs! That could easily cost you £800-£1,200, which is ludicrous. A good pair of boots will cost a fraction of that and will probably last for the entire trail, and then some2. You only do one or two relatively short long-distance routes a year, and wear sturdier boots for shorter outings. Although I’ll always take advantage of option two if the opportunity presents itself, I’m leaning towards option three. At this point, trail shoes represent my biggest gear expense, because they’re disposable – a pair only lasts one or two trips before having to be binned. Maybe I’ve been unlucky, or maybe I’m just hard on footwear; I’ve certainly heard of others who have managed to get 500 miles or so out of a pair of Inov-8s. On the other hand, I’ve spoken to others online who have been disappointed with the durability of their trail shoes. Ultimately, the footwear we often choose is designed for running, not backpacking, and the demands are somewhat different. I think it’s time the outdoor gear manufacturers offered us some mesh shoes specifically designed for backpacking. I’d like them to be light (up to, say, 600g per foot would be acceptable), quick-draining, flexible, with a really good Vibram sole and the durability to last at least 500-600 miles. Does such a shoe exist on the market today? I don’t know, but it must be possible to build it. Inov-8 is the obvious company to take on such a challenge. I’d be interested to hear any views on durability and trail shoes. Have your shoes also fallen to bits after a couple of hundred miles? Or perhaps you’ve found a model that lasts a bit longer? There is a general engineering maxim ‘Fast, cheap, reliable – pick any two’ and I guess the equivalent for footwear is ‘Light, cheap, durable…’ I don’t know anything about fabric technology but I would guess it is possible to make more durable shoes but the costs would rise dramatically. Having said this, my experiences with old-style Inov-8s were better – about 500 miles before they were retired for low-level walks. The mesh was a bit tatty but the real problem was sole wear, which I think reflected the way I walk. However, the newer Inov-8s seem to be less durable (they certainly look it). I had a very bad experience using old worn shoes on rough paths – I damaged my foot (in May) which I’m told will take up to a year to recover. So, best not to try and extend shoe life too far. Hi Ian, thanks for your thoughts on this. I think you’re right – it’s very difficult to find shoes that are light, cheap *and* durable (and the learning curve can be expensive until you find the right shoes for you!). I have also heard that old-style Inov-8s were more durable. I basically agree Alex, especially as most shoes are trail running shoes, but lately I’ve been using ultra-running shoes, first Altra (Lone Peak 2.0) and now the Inov-8 Ultra 290 and they both been useful for much more than my previous trail shoes. I think lightweight backpackers should look into the gear that ultra runners use more than what trail runners use as they have a strong buying power and similar demands from their gear as us.